Rarotonga in the Cook Islands is a terrific spot to either relax on a beach, by a resort pool, tootle around at leisure, or get stuck into some adventure activities. If you are there to have a chill-out holiday our advice is that before you do anything else you should do an island tour to get your bearings. This could be just hopping on the buses - it's easy as there is only one main road and the buses go either Clockwise or Anti-clockwise - have a Raro Safari Tour, or another organised tour like the Island Discovery with Raro Tours. 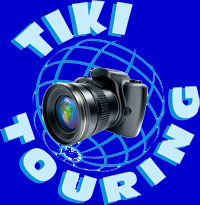 With organised tours you will get to know about the culture and history of the islands and are well worth the money. You'll also be able to spot places that grab your interest and you can return to later. 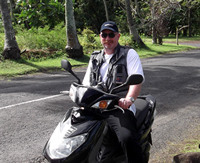 Once you have got your bearings and are sick of lounging around the pool until cocktail hour, then you can hire a car or scooter for your own exploration. New helmet laws mean that everyone on a visitor's licence - and their passengers - need to wear a motorbike helmet. Here we would suggest if you do want to hire transport then you get started earlier rather than later as the queues can be quite long at the major resorts. Take your national driver's licence with you and either go for a one-day temporary Cook Islands licence, or go to the police station in Avarua to get a visitor's one. For scooters you will need to do a theory exam and skills test but you can read more about that by going to our getting around page. While there is one main road around Rarotonga it is worthwhile checking out the backroads to get a view of the island's interior and its bush landscapes. One of the most popular events in Rarotonga is the weekly Saturday morning Punanga Nui Market in Avarua. This is a mix of fresh food, clothing, arts and crafts and vegetable stalls. To get the best at this market you need to be there reasonably early. Take your time once there and just enjoy browsing, buying or people watching. Snorkelling and diving are very popular and you can don a mask and flippers on tours to splash about with colourful tropical fish. We did the Captain Tama's Lagoon Cruise, which is highly recommended, and also while on Aitutaki had a fabulous day on Aitutaki lagoon's Vaka Lagoon Cruise in one of the most beautiful destinations in the world. No exaggeration, just check out the photos of Aitutaki's lagoon. You can also Sea Scooter with Ariki Adventures, paddleboard and kayak. In addition to snorkelling you can also learn to dive, or just scuba dive, while on Rarotonga. here are several dive schools and plenty of diving trips available. If getting wet in warm waters doesn't appeal, then you can always try your hand at game fishing on a charter boat. Sometimes this can take a few days to organise numbers so if you want to land The Big One begin to organise a trip early on in your stay. To get an idea on Cook Islands history and culture you should attend an organised cultural experience. We went to two evenings - one at the Edgewater Resort and the other at Highland Paradise's Drums of Our Forefathers. Both were very enjoyable shows with plenty of those amazing drums and dancing, but Highland Paradise is a dedicated cultural show that takes you into an old style Cook Islands village, tells you the history of the people, has warriors in authentic costumes, takes you to their sacred marae, feeds you a really good meal (as does the Edgewater) and then has a drums and dance show taking you from the earliest days to recent times. Here I have to say I love Cook Islands drumming, there is something about it that gets into my blood. Actually, I just love the Cook Islands and that's why we now live there.